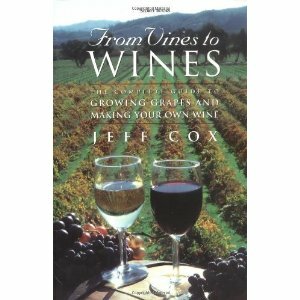 From Vines to Wines by Jeff Cox is perhaps the simplest and easiest to use guide out there for growing your own grapes and then making wine from them. The book delves just enough into the details to help the reader understand “why” Cox recommends a way of doing things, but never gets too complicated or deep into the chemistry of the wine making process. The book is divided into three chapters; Selecting the Vines, Growing the Grapes, and Making the Wine. Each chapter goes through all the essential processes and decisions you as vintner and wine maker will need to make; providing adequate education and information to help along the way. The Appendices offer tools such as The Home Winemaker’s Record Book and resources such as Lists of Suppliers and Common Pests and Controls. This wine book is written in such an easy manner that we found ourselves reading it cover to cover despite not having our own vines. That being said the book also makes wine making sound so exciting and gives the reader such confidence that we immediately began thinking about when (not if) we should get our own vines! Overall a very well written and easy to use guide to growing vines and making your own wine. Recommended for the backyard enthusiast as well as those who’d like a bit more appreciation of how that glass of wine came into being.